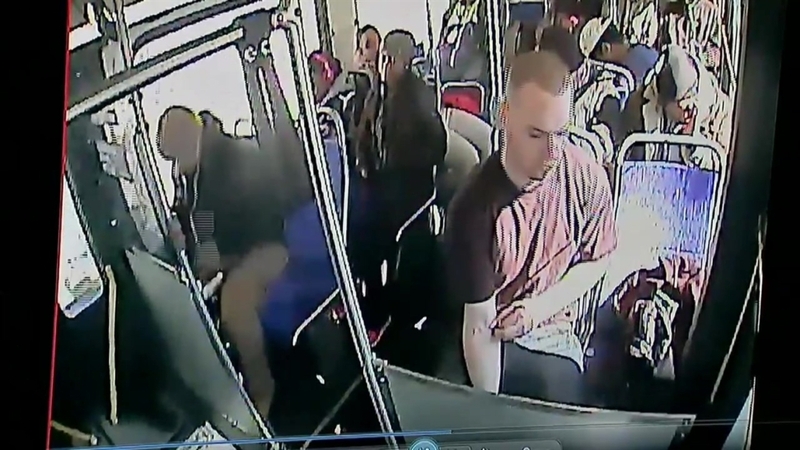 Michael Meeney was close to death when he hit the floor of the Route 111 SEPTA bus last Thursday afternoon. Moments before, the 25-year-old Middletown, Delaware County man had injected heroin into his right arm. The drug was too much for his body, causing him to slip into an overdose. Passengers yelled for help and called 9-1-1 as the driver stopped the packed bus along State Road near Lansdowne Avenue. Upper Darby police officer Matt Rugh was first to arrive. NBC10's Lauren Mayk has the latest on a man caught on camera shooting up heroin and overdosing. Upper Darby police saved the man with narcan. This video may be disturbing to some viewers. He opened a little red box attached to his keychain and grabbed a vial containing Narcan, the brand name of the opiate overdose reversal spray naloxone. Rugh put the vial to Meeney's nostrils and sprayed. Within minutes, Meeney was awake, talking and able to walk to a waiting ambulance. Meeney was Upper Darby police's 54th overdose save over the past year. "It's unbelievable," Michael Chitwood, Upper Darby's police superintendent, said Tuesday as he shared surveillance video of Meeney's heroin use, overdose and rescue. The superintendent chose to share the video, he said, so the community could see how pervasive the heroin and opioid epidemic is in our region. Chitwood said he and his officers are thrilled to prevent a death with naloxone, but are frustrated because they feel it's just a stopgap. The naloxone will force the victim's body into painful withdrawal leaving them virtually no choice except to go out and use again that day. "OK, we saved a life, for what? So they can continue to feed the path of addiction?" Chitwood asks rhetorically. "They need help. We as a society need to help them." A Generation Addicted, an NBC10 Digital Exclusive investigation exploring the tragic world of heroin and opioid addiction in the Philadelphia area and beyond, will premiere March 21. Treatment offerings for drug addiction, particularly opiates like heroin, are overwhelmed by the sheer number of people who need the services. Facilities are regularly full, and there are many barriers to getting care for those with and without insurance, especially the latter. In nearby Philadelphia, which is considered "treatment rich" by advocates and officials because of the number of options for people seeking help, a person has a one in 10 chance of getting the treatment they need. That's on par with other cities around the country. In 2014, more than 1,700 people died from drug overdoses in Southeastern Pennsylvania, South Jersey and Delaware, an NBC10 examination of medical-examiner reports show. It's an epidemic that has municipalities all around the region and across the country scrambling for solutions. Fred Harran, Bensalem Township's public safety director, sends certified letters to a person's doctor when they overdose in his town on prescription painkillers, the major gateway to heroin. The goal is to alert doctors that the patients are dealing with an addiction problem. Philadelphia is working to develop a diversion court to keep people suffering from drug addiction out of jail and get them into treatment. Chitwood is in discussions to offer drug addicted people seeking treatment a safe harbor at the police station. A resident who voluntarily comes in asking for help would be transferred to a local treatment center. It's modeled on an innovative and praised program in Gloucester, Mass. There's no date for when the Upper Darby and Philadelphia programs would launch. In the meantime, Chitwood uses the only tool at his disposal: arrest. Meeney was charged with possession after officers found four bags of heroin stuffed in his wallet. He was arrested at his home Monday after testing confirmed the bags contained the drug, Chitwood said. Attorney information for Meeney wasn't immediately available. Chitwood doesn't think it's a solution, but he feels it's his only option to try and get the man some treatment. Maybe he'll be mandated to enroll in a drug program. Maybe he won't. "My hope is that he gets the help for the addiction. He’s one of thousands of people out there in our community that are addicted to heroin. It is the biggest problem we deal with," Chitwood said.